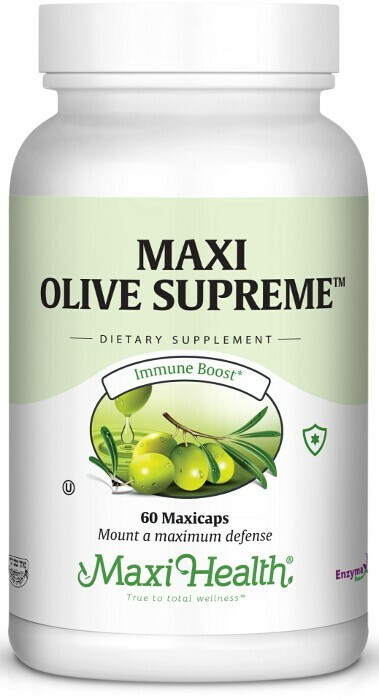 Maxi Olive Supreme™, available only from Maxi Health Research®, is a unique nutritional formula! Olive Leaf (and its extract contains a substance called oleuropein which gives the olive leaves their resistance to insects and bacterial damage. PureGar (odor controlled garlic) is the garlic of choice for those who seek its healthful properties. The volatile oil found in garlic is an effective agent and is largely excreted via the lungs. This is beneficial for the respiratory system. Garlic supports a healthy heart and circulatory system. Oregano contains natural minerals such as calcium, magnesium, potassium, copper, boron and manganese. It also contains vitamin A, vitamin C and niacin. Earthrise® Spirulina is a food grade algae. It is a whole food rich in minerals, vitamins, proteins, essential amino acids and essential fatty acids, including iron, and beta-carotene. Maxi-Health Research® only uses Earthrise® Spirulina known for its high quality and low heavy metal content. Experience the support of olive leaf extract and these other popular natural ingredients working together for you in Maxi Olive Supreme™. Take one (1) to two (2) Maxicaps™ daily, or as directed. Other Ingredients: Vegetable cellulose, rice flour, magnesium stearate, Enzymax® calcium carbonate, bromelain, papain, lipase, amylase, protease, silica). This product contains no animal products, wheat, yeast, gluten, soy, salt, sugar, milk, artificial flavors, colorings or preservatives.